Add the finishing touches to your wedding with this Beach theme bridal accessory set. Each piece is hand crafted in elegant seasonally colored poly resin with rhinestone and Seashell accents. 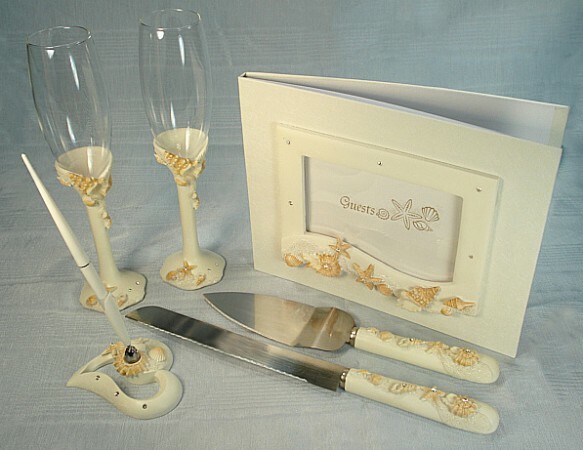 The 4 piece set includes an 8" X 10" guest book, two 9.5" x 2.5"D high toasting flutes, an about 3.5"L x 3.25"W x 1.5"H pen set and a 10" cake and 11.5" knife set and all pieces are packaged in design printed clear top boxes. Designed exclusively by D’Lusso Designs. Weight for the set: 4.5 lbs.